Experienced genealogist, instructor, desktop publisher, administrator, and accountant who enjoys contributing time and talent to worthwhile organizations and enterprises. 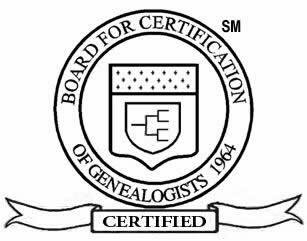 Certified by the Board for Certification of Genealogists; special interests in Oklahoma and Native American research. Regularly attends lectures at local, regional, and national conferences. Attended the Institute for Genealogy and Historical Research at Samford University, 1994 and 1995. Researches in libraries, courthouses and archives as well as online, and prepares detailed reports, on an ongoing or one-time basis, for approximately ten clients each year. Maintains networked Macintosh system, library of reference materials, microform equipment, and a customized research reporting database in the home. Has presented programs for the Cherokee Heritage Center, Tulsa Genealogical Society, community groups and for the Tulsa City County Library. Was a member of the Board of Directors of the Association of Professional Genealogists, 2000-2002. Vice president & co-owner of family-owned sailboat dealership and marine accessory store. Master of Library and Information Studies - University of Oklahoma, Norman. Bachelor of Business Administration - Accounting ­ - University of Oklahoma, Norman. Course II (Intermediate Genealogy) and Course IV (Advanced Methodology) graduate ­ Samford University’s Institute of Genealogy and Historical Research, Birmingham, Alabama. Board for Certification of Genealogists ­ Certified Genealogical Record Specialist since February 1998.